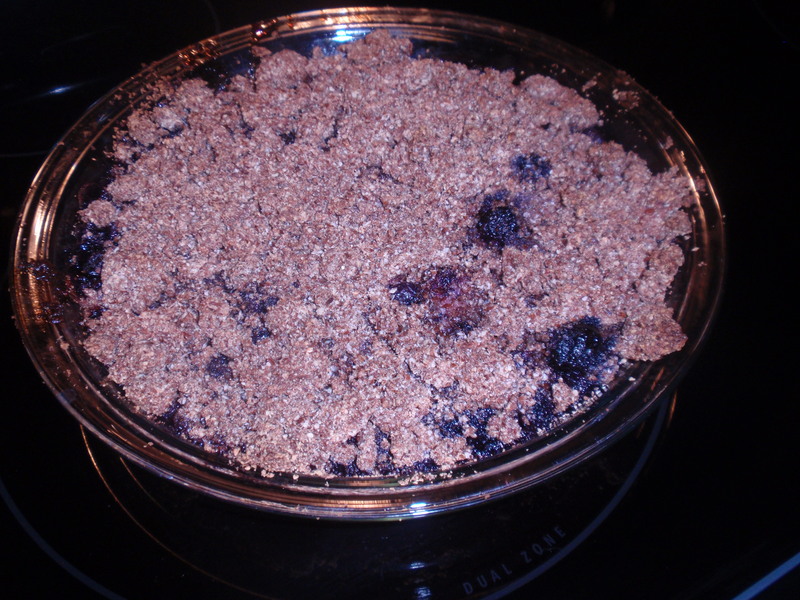 For my first test recipe, I decided to try the Berry Good Cobbler from Everyday Paleo by Sarah Fragoso (page 216). The recipe called for blackberries, but said other berries, peaches, or apples could be used. I went with frozen blueberries, since they were cheaper than blackberries. 1. Put berries in a pie pan. Drizzle with honey, if desired. 2. Mix the cobbler topping until it forms crumbles. 3. Put the topping over the berries. 4. Bake for 35 minutes at 350 degrees. 5. Serve in bowls and pour the coconut milk over the top. I’ve never had cobbler before, so I didn’t quite know what to expect. I’m not really a pie person, but I thought I’d start with something new. The recipe was very easy to make. It took about five minutes to get it in the oven.I thought 2 T of cinnamon seemed like a ton, but it really didn’t taste that much like cinnamon. Also, I tried to “drizzle” the raw honey, but it’s too thick. I decided to use a spoon and mix it in with the blueberries. That didn’t work well either. I think next time I’ll try heating it up slightly, to see if that will thin it out. Or, maybe I could mix it in with the cobbler topping instead. I didn’t use any coconut milk over the top. It tasted okay. It would probably be better if it were sweeter, but that would defeat the point of a paleo dessert. It seemed a little plain, like something else was missing. I think some vanilla might help. Posted by Hoppy on November 17, 2011 in Dessert and tagged blueberries, dessert. hmm, this looks interesting. I am not paleo, but we just went gluten-free so it kind of looks close. I was reading that most carbs/grains are not really good for you, so an ideal diet would look paleo..but I have 4 kids that would not be very happy with me… I make an apple cobbler that is similar to this, it is apples, butter, brown sugar and I changed the flour to almond meal. It came out nice. Next time I’m going to try doing halve almond meal and half non-gluten flour, just to see if it’s any better. We keep our sons gluten-free (but not grain or dairy-free) in case they inherited the gluten intolerance that I, my dad, and my brother have. In your case, I’d suggest not declaring the end of grains, but just start cooking mostly grain-free dishes. Just gradually add in some new ones and slip them in under the radar. My husband eats gluten, but since I won’t cook it, he eats way less than most people. I used to be very pleased to find this net-site.I wanted to thanks on your time for this glorious learn!! I positively having fun with each small small bit of it and I’ve you bookmarked to take a look at new stuff you blog post. I've been on a gluten-free and dairy-free diet for years and now I'm trying to move towards a paleo/low-carb type diet. I want to avoid the diabetes that is common in both sides of my family, lose a little weight, gain energy, and gain muscle. Enter your email address to follow Discover Paleo and receive notifications of new posts by email.